« What's With All the Mirrorless Cameras? Two new m4/3 lenses got a sneak preview in a glass case at CES: the 12-35mm f/2.8 and 35-100mm f/2.8, both with 58mm filter rings and OIS (Panasonic's image stabilization scheme). These two lenses would provide the 24-70, 70-200mm equivalents that form the core of many pro kits, though technically an m4/3 lens should be faster than f/2.8 to provide equivalent function. As such, they'd fill a key hole currently in the m4/3 lens offerings. While I'm a proponent of road maps that show where a system is likely to go, I don't understand the tendency of the camera industry to show non-working prototypes under glass at trade shows. All this does is dull the eventual announcement excitement. Technically, it's a form of FUD marketing (fear, uncertainty, doubt); an attempt to delay purchasing decisions of potential alternative products. 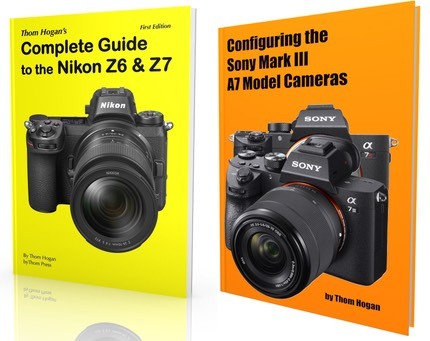 But I have strong doubts that such tactics work, and I'd argue that they have a strong potential to backfire (consider what happened to Sony's NEX-7 and A77 cameras when the Thailand flood delayed production). Why do companies do it? Because they think they have to have a constant trickle of "news" for their users. Indeed, the rumor sites are filled with intentional leaks from companies to help fuel this. Of course, this leads to the Boy Who Cried Wolf problem: eventually the constant stream of small leaked details becomes just noise and gets ignored. If you want a constant stream of useful information to users, how about a better and proactive customer support system? You'll note that I don't normally deal in future products or rumors on this site. I try to keep to the real news. Unfortunately, by doing the "glass trophy case launch" thing, Panasonic has essentially created news about these lenses, even though they don't exist yet and you can't buy one. I won't put them into the lens database until they're officially launched.